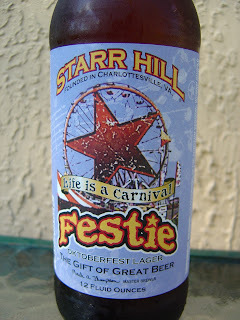 Today I'm drinking Festie brewed by Starr Hill Brewery in Crozet, Virginia. The label depicts a Ferris Wheel with the Starr Hill star as the center structure of it. "Life is a carnival" says the label. Purchase before February, and I'll just guess they mean 2011. Not much for an aroma, perhaps a little spice is all. 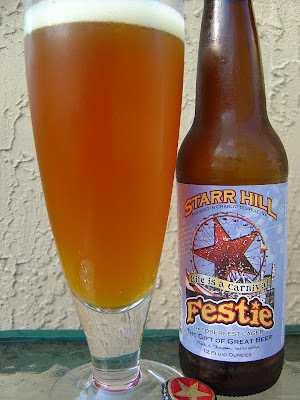 Tart and a little sour apple and orange start things off. Bread and grain and caramel and earth. Very manufactured! Nothing is working together at all. Prickly carbonation. Kinda yuck, chewing on an ugly stick of butter. Didn't finish it. Pass every time!